Reasons Why Pest Off! 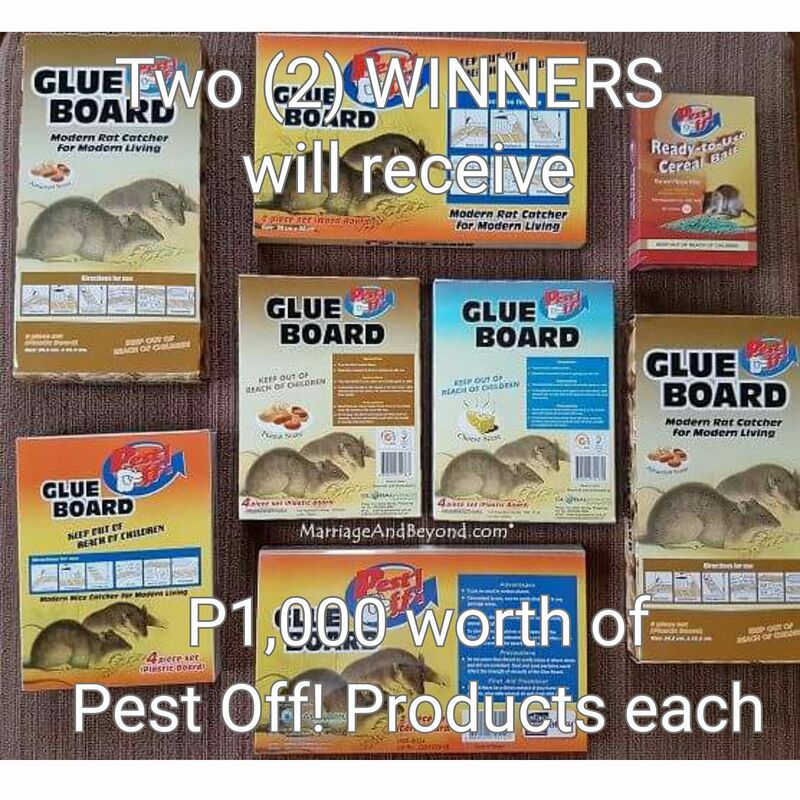 is the Better Rodent Control Product for Your Home and a chance to win P1,000 worth of Pest Off! Package. One of the many concerns a homeowner needs to constantly face is to make sure no pest invasion takes place. This is why we have our termite treatment done on a yearly basis. We don’t want to take chances. But how about rodents? What’s the most cost effective way to keep pests at bay? In all honesty, I’m not very comfortable when it comes to the health issues that the termite treatment we get done yearly comes with. The high concentration of Sulfuryl flouride can be toxic to humans when inhaled. I’m not asthmatic, I’m pretty tolerant to annoying fumes but I do know this for a fact, that the last time we had the fumigation done, the smell of the pesticides that were used stayed within our home for a weeks, even months. My human gauge was also a giveaway, since the smell triggered my husband’s asthma. He had to take his asthma medication until the fume has fully dissipated. This said, if it were up to me, I’ll always choose the most natural, non-toxic way of getting rid of house pests. And While we don’t have much choice when it comes to termite, it’s a good thing that we do when it comes to rodents and bugs. Ready for use. Just the the product off the box and strategically place the glue board where those nasty rats may be lurking. Disposal can either by placing the trapped mouse with the board in a plastic. What we do is get the board with the trapped mice in front of our porch and the cat takes care of it. This for me is better as it makes sense in the biotic interactions within the ecosystem. It’s the “greener” choice, I believe. 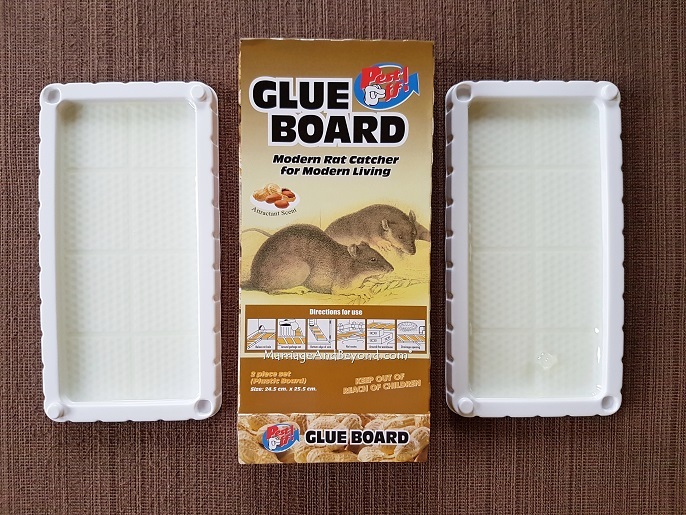 When the mice and rats pass along the glue boards, it’s inevitable for them to get trapped because of the powerful adhesive. This can’t be said enough. The adhesive that Pest-Off! uses is non-toxic. In the event that a body part comes in contact with the glue, it can wiped away with baby oil. No danger of getting fingers caught, like that of conventional mouse traps too. 4. Affordable and Reasonably Priced. Pest Off! is more affordable than its competitor. Glue Board comes in sets of 2’s and 4’s. Since rodents come in different sizes, Pest Off! 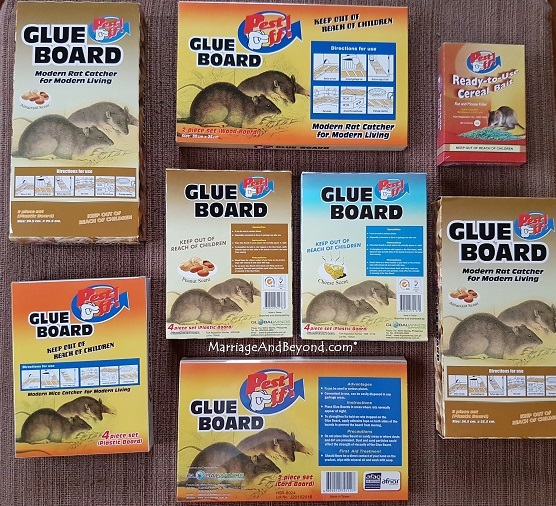 comes in different board materials (cardboard, wood board and plastic board) available in peanut and cheese scents that attracts the pests more effectively. I don’t want to gross you out, so I blurred the trapped mouse. I wouldn’t be too sure about citing out these reasons if I wasn’t convinced myself that these pest-busters are what they claim they are! Both boards I placed trapped two little mice squeaking for dear life in less than 24 hours. If that isn’t effective, I don’t know what is! I placed another one the day after and it caught another. Yikes! How many of these pests have we been co-habitating with and for how long! We love our home, right? Annoyingly, so do pests. While we can only do so much to keep our house clean, pest invasion is often inevitable as the home ages. Good thing there’s Pest Off! to address just that. Two (2) Winners will each receive a Pest Off! Rodent Control Package. Open to all Philippine residents who are of legal age. Click on the Rafflecopter widget below to join! The moment I saw ongoing giveaways on FB, I checked if there are available packs nearby, and I found them in Ace Hardware. Purchased a couple in cartonboard, and placed them right away in our home as suggested. In less than 2 hrs., we caught one “friendly” rat. So I am trying my luck here!! I hope to win some more and make my home rodent/rat free finally!! As dad, I shoud be the bravest at home but when pest strikes it really frightened us all. Of course, I do not want pests to be in my territory and I do not want them to nibble and ruin everything even a single piece of stuff that is really important to us. I was alarmed when I saw a mice entered our house and ran into our room, it really scared me because I do not want my toddler to be harmed so I did not let a night pass and I immediately bought pest control. I have to say that it really eat my budget because I need to buy different traps so this tiny little crap will be trapped. 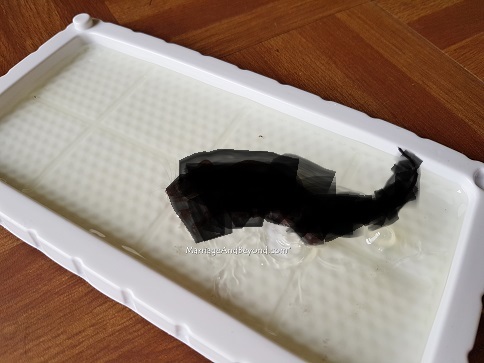 Your giveaway is so helpful so that I will be at ease that in case pest will enter, I have trap to keep them away and not to come back anymore. Of course, I considered Pest Off as this is the brand that I have testes that solved our problem. It is proven safe, effective, and economical. Trully the best buy for a pest free house. I hope I win this giveaway because we are using Pest-Off to trap pests at home. It is proven safe, effective, and cost-saving. I have a toddler and I am concerned because I want to use products that is safe and Pest-Off has it. We can now sleep knowing that Pest-Off will be our guard for a home that is pest free. I also want to try the effectiveness of Pest Off! I need to win, Jen! Daming rats dito O.o nakakainis na! I hope to win because we actually use this product and it’s safe and effective. Bilis makahuli ng mabait…kaya di ako nawawalan ng stock dito sa bahay. Na recommend ko pa sya sa isang customer na pumipili ng pang trap sa daga sa Unimec Comembo. i really need this. napaka daming rats dito sa bahay ng hubby ko because napapagitnaan sila ng mga bahay na nagbebenta ng pagkain so madaling maatract ang mga rats kaya pati tuloy dito samin pumapasok na. =( kaya nang nakita ko tong giveaway mo, join agad ako. Hope to win. goodluck to everyone of us..